Flamingo House is stylishly and lovingly furnished. This comfortable, spacious and well-equipped house provides the perfect getaway for families and friends. The accommodation is on 3 floors and offers 4 bedrooms, a family bathroom on the first floor and a downstairs WC. There is WiFi, central heating and, for younger guests, a high chair, travel cot and children's crockery and cutlery. 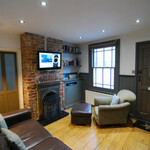 There are two cosy sitting rooms for guests to relax and unwind. The front sitting room has two comfortable sofas, a smart TV, DVD player, and a working fireplace. The back sitting room snug, which has a door to the garden, has a large sofa and a bean bag. It has a TV and is well stocked with books and games, an ideal kids' hideout. The south-facing kitchen/diner is light, airy and spacious. It has a large table which seats 8 and is well supplied with lots of lovely accessories for dining and cooking. It has a large range gas cooker, electric fan oven, fridge/freezer, dishwasher, washing machine, tumble dryer and a microwave. The kitchen leads out to a sunny garden with a terrace and lawn. It has an outdoor table, 8 chairs and a gas BBQ. The garden is the perfect setting for al fresco dining or just relaxing outdoors with a book and a glass of wine. The front bedroom is bright and roomy, with a king size bed, two large wardrobes, two bedside cabinets, a blanket box and a dressing table. 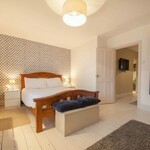 Bedroom two is furnished with a double bed, a chest of drawers, two bedside cabinets and a stylish open-hanging rail. The twin bedroom has two beds, a desk and chair, a set of drawers, a bedside cabinet and a wall-mounted hanging rail. The bathroom has a bath, a lovely overhead shower, a wash basin and a WC, plus a large airing cupboard for storage. There is space for shoes, coats and beach gear in the generous hallway outside the bathroom. The attic room has two twin beds, plus two bedside tables and a cupboard for clothes. This room is perfect for children – it has a hamper full of toys and a great collection of kids' books. And, unlike many other houses in Whitstable, the stairs to the loft are not steep. The loft windows have stunning views over the nearby golf course. Please Note: The house is in a quiet neighbourhood, so please no rowdy parties!!! 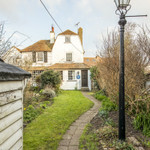 This charming house is in the heart of Whitstable, with the beach a 4 minute walk at one end of the road, and the vibrant high street at the other.